98 BELLIN, J.N. L'Empire de La Chine. ( Paris, 1748) Petites taches brunes, rousseurs. - A few brown spots. 290 x 403 mm. � Attractive map of China with Korea and Taiwan. Decorative title cartouches in three corners. 99 JANSSON, J. Iunnan, Queicheu, Quangsi, et Quantung.. ( Amsterdam, ca. 1680) Col. Petite d�chirure restaur�e en haut � droite 2 cm � l'int. de la carte. - Repair of tear on upper right margin, 2 cm into engraved area. 463 x 525 mm. 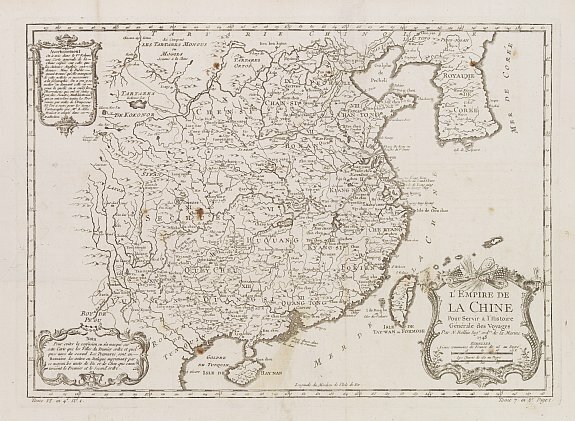 � Carte repr�sentant la partie sud de la Chine. 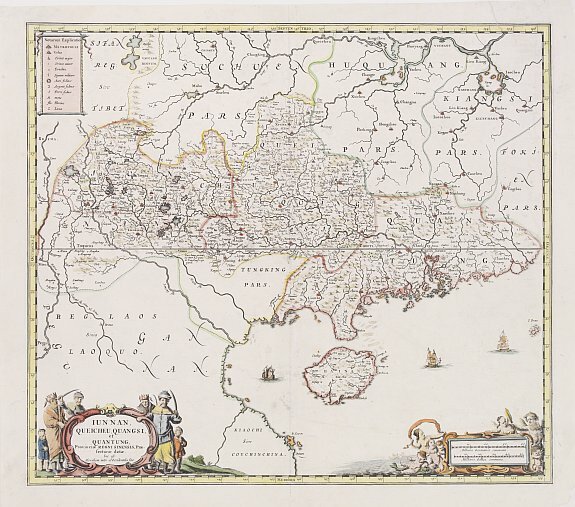 - A beautifully engraved map of Southern China covering Hainan and the Pearl River Delta with Macao and the islands around present-day Hong Kong. 101 CORONELLI, V.M. Xansi, e Xensi.. ( Venise, 1695) Col. Sur papier fort. - On heavy paper. Hand col. 465 x 610 mm. � An attractive map of this north-western province with a prominent Great Wall. Coronelli used Jesuit information for his maps. This was the first detailed provincial survey of China since those compiled by Jesuit superior Martino Martini. 102 L'ISLE, G. de. 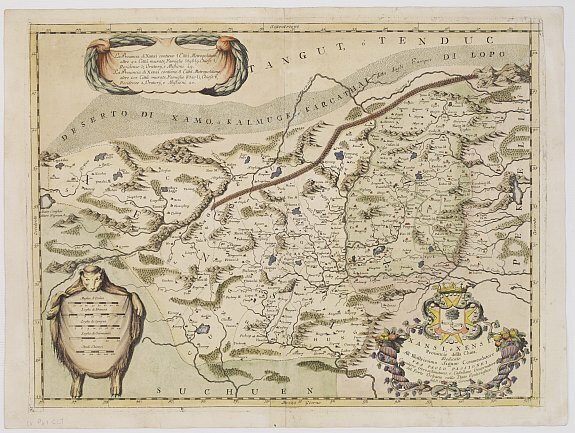 Carte de Tartarie. ( Paris, Chez l'Auteur sur le Quai de l'Horloge a l'Aigle d'or, 1706) Limites en col. ancien. Petite d�chirure aux extr�mit�s du pli central. 483 x 634 mm. � Carte d'Asie centrale et septentrionale, d�limit�e au sud par la Cor�e, le Tibet et le nord de L'Inde. - Detailed map covering north east Asia, Tibet, Korea and part of Terre d' Eso. Nova Zembla joined with the mainland. 103 BELLIN, J.N. 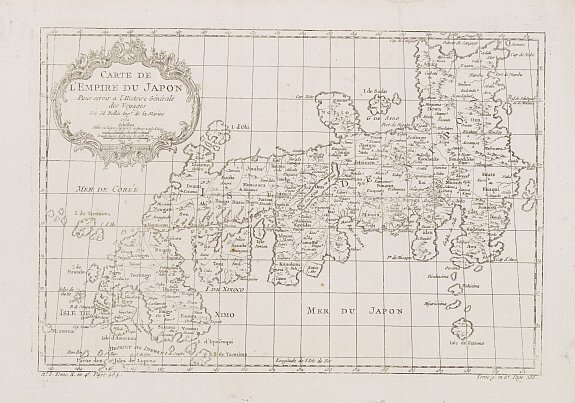 Carte de L'empire du Japon. ( Paris, ca. 1750) 215 x 310 mm. 104 BELLIN, J.N. Carte de L'Empire du Japon. ( Paris, 1752) A few brown spots. 215 x 310 mm. 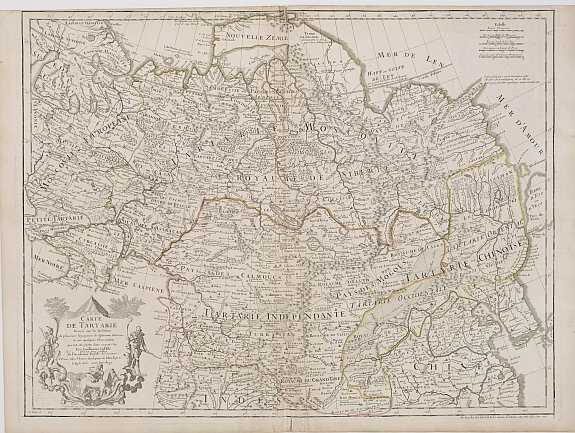 � A fine map of Japan embellished with fine baroque cartouche. Bellin influenced other cartographers with his erroneous portrayals of Japan. This is seen in the distortion of the Noto peninsula as well as the exaggerated size of the Oki Islands. - Campbell 67; OAG 101.